In the last couple of weeks, I have skimmed through collections of articles and papers and books that measure the main currency of relationships from different fields. They include but are not limited to Sociology, Economics, Business, Computing, Artificial Intelligence, Transportation, Game Theory, Politics, Law, Psychology, Neuroscience, Genetics, Communications, Physics, and other fields that look into relationships of interconnected entities or nodes that form a network. My objective was to create a practical guide simple enough to help me plan behavioral strategies to form better relationships. The available evidence is extensive and I will probably write a book about it soon. But, just to summarize, here's what I came up with. 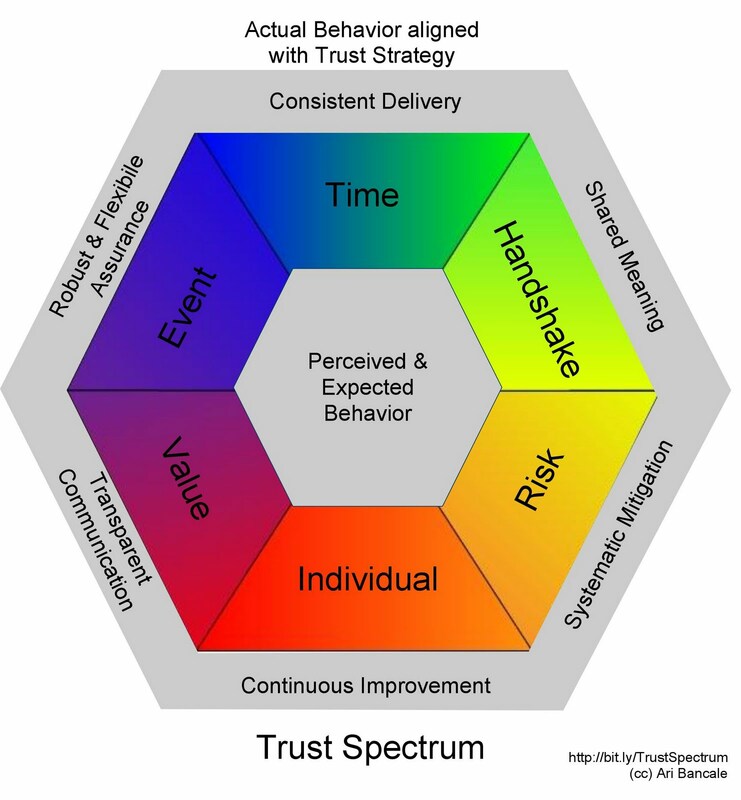 The Trust Spectrum (THRIVE) is a 6-point checklist for building a strong relationship. Each component is necessary in all types of relationships. The quality of each component will determine the quality of the bond between two nodes. Let us start with definitions. Trust is an agreement of truth or expected behavior given by one node to another. A node is a single entity in a network. It can either be a person, an organization, a product, a piece of information or anything that another entity can relate to or connect with. For example, a husband trusts his wife to remain committed to their marriage. Students trust their teacher to provide them with correct information. A business owner trusts the Internet connection to be operational 24x7. Now on with the components. Time. A relationship is defined by its lifetime. A strong relationship becomes stronger through time, but a weak relationship becomes weaker without intervention. Handshake. Different types of relationships will have different types of linkages. The context will include the initial and subsequent intention of each entity for forming the relationship. Individual and collective objectives of the network must continuously be met. Norms & rules based on designated identities of both nodes are also definitive. Control & influence of each entity on the relationship must create a balance of power. Risk & Vulnerability. Trust is most needed when it is most difficult to give. Every relationship that is formed will require a certain level of risk from both sides. The kind of risk that each entity is willing to take is directly related to the level of vulnerability that they are willing to expose. There are a lot of trust activities and strategies that can be systematized to lower the level of risk and vulnerability exposure. Individual Node. Integrity. Credibility. Reputation. Authenticity. Sincerity. These are only some of the descriptive requirements to measure the Trustworthiness of a single node. Value. What is the cost of creating and maintaining this relationship? What are the short- and long-term benefits of being in this relationship? What is the cost of forming connections with other similar nodes? What is the cost and compensation of dissolving this relationship? These are some of the quantitative questions that can be asked when appraising existing and planned connections. Event. Relationships are also defined by the kind of activities done by one node to the other or done by both entities together. Predictability of the desired behavior is a good measure of the level of trust given and received mutually by both nodes. Security of the connection is also a deciding factor in any type of relationship. Contracts and assurance mechanisms are created primarily to systematize event-related trust issues. Books and doctoral theses have been written on the topic for several decades now. I certainly cannot go through all aspects of trust in one blog entry. But, I've laid out my framework. So far, I am confident that the THRIVE spectrum of trust is inclusive. So far, all aspects of trust that I have encountered can be neatly placed under one of the components. 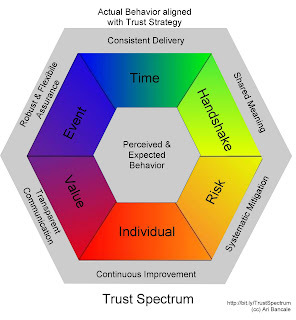 I will dedicate one blog entry for each of the trust components in the coming weeks. Here's a very funny and an extremely inspiring talk on giving away your trust for fun and for becoming a part of something bigger than yourself.